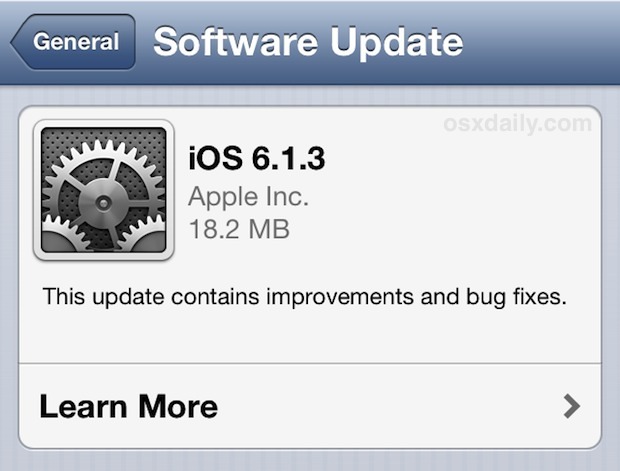 Apple has released iOS 6.1.3, a relatively minor software update that includes a patch for the bug that allowed someone to bypass the lock screen and access the Phone app, and also brings some improvements to Maps in Japan. Additionally, the update patches the evasi0n jailbreak, thereby preventing devices from being jailbroken by that tool in the future. There are no known feature additions or changes. The update is available to all iOS 6 compatible devices including iPhone 3GS, iPhone 4, iPhone 4S, iPhone 5, iPad 2, iPad 3, iPad 4, iPad Mini, and iPod touch 4th & 5th generations. Advanced users can use IPSW files and manually update the iOS firmware with iTunes. Right click and choose “Save As”, the resulting firmware file should always have a .ipsw file extension. If you’ve been enjoying a jailbroken iPhone or iPad, or simply want to keep your device eligible for jailbreaks, you’ll want to avoid the iOS 6.1.3 update for now as it patches the methods used by the Evasi0n tool to jailbreak iOS 6 through iOS 6.1.2. It is possible a new jailbreak for iOS 6.1.3 will surface, but as of now one does not exist. An important reminder, once you update iOS it is not possible to downgrade to a previous version of system software. This is unimportant for the vast majority of users, but jailbreakers should be aware of this. minor fixes and improvement? i say this update is intended for stopping evasion jailbreak only.. I am currently in Dubai, UAE. I have an iPhone 5 with Model Number A1429. I downloaded the iOS 6.1.3 iPhone 5 GSM. But when i tried to restore my iPhone using iTunes, it says that the firmware is incompatible. Is there a chance that the two IPSW Files for iPhone 5 got messed up again just like what happened last year with the IPSW Files for the iPad 3? Right now I am again downloading the IPSW for iPhone 5 CDMA and will try it later after the download is completed. Will post comment later….. I have used an ipsw file to upgrade my girlfriends iPhone and it didn’t erase anything (iPhone4). I have had a problem upgrading my own phone (iPhone5) using the ispw file, both for the 6.1.2 and 6.1.3. I was hoping that Alex would post again to say how he got on with the CDMA version. Please describe the method you followed. Did it do an update only or full wipe and restore to new is? My model number is MD297B/A so I guess the CDMA file may not be correct for my phone. Download both files for iPhone 5. Connect your iPhone to your PC/Laptop. itunes will open automatically, then back up everything first. Then on your keyboard, press “shift” and simultaneously click “restore” in itunes. A box will appear and search for the IPSW file that you downloaded earlier, try which one will work for your iphone model. After the iphone is completely restored with the updated iOS, you will then have the option to set it up as a new iphone or restore from back up. if you dont want to loose your previous data, then select restore from back up. That’s it.